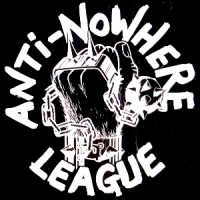 Anti-Nowhere League are an English punk band formed in 1980 by singer Animal (Nick Culmer), guitarist Magoo (Chris Exall), drummer Bones (Tony Shaw) and Baggy Elvy on bass. The band split in 1989, reforming three years later in 1992. Current line-up (as of 2010) features: Animal - Vocals, Johnny Skullknuckles - Lead Guitar, Shady - Bass Guitar and Nato - Drums. They gained notoriety with the singles "Streets of London", "So **** What" and "**** Around The Clock".